der-materialspezialist Dr. Jekyll & Mr. Hyde, a dynamic combination blade, for forehand offensive play and backhand defense. Dr.Jekyll & Mr.Hyde is the new 6 ply combination blade from der-materialspezialist. Dr.Jekyll & Mr.Hyde utilizes a revolutionary manufacturing technique which creates a perfect speed reduction. 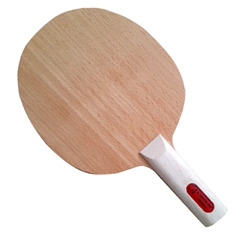 The perfect balance, highest craftsmanship and its light weight make Dr.Jekyll & Mr.Hyde to another top-product for the professional table tennis player. Experience the difference! Weight: 65g Wood: 6 Ply all wood with balsa. der materialspezialst is a newly founded German based table tennis company, founded by Mr. Guido Heun. The company specializes in offering a complete line of exceptional quality inverted, short pips, and long pip rubbers; racquets and accessories. All der materialspezialst equipment is ITTF approved and plastic ball ready for the serious table tennis tournament athlete, club player or competitive recreationalist.